The (Not So) Little Guys Midseason Rankings: Who Will Emerge on New Year’s Day? Fudge Van Hooser did such a good job on the Four Horsemen of the AAC a few weeks ago, that we brought him back for the whole top ten this week. For those of you who don’t know, Fudge is a Tulane student who works directly with the football and basketball teams over there and, as such, sees more Group of Five games than probably anyone. There’s this Georgia college football team that runs the triple option really well – the way its supposed to be run. Surprisingly, though, that team is NOT Georgia Tech as we all thought at the beginning of the year. Georgia Southern (5-2, 3-1 Sun Belt) leads the FBS in rushing offense, averaging 368.9 yards per game while adding 31 (count them…31) touchdowns on the ground. The Eagles’ only two losses came to West Virginia in week one, and Appalachian State last week. The remaining schedule is fairly easy, with the exception of the Eagles marching into Athens to take on the Bulldogs who reign in Sanford Stadium. We always expect Boise to be in the top 10 of the Group of Five schools. Heck, its not that odd for them to be close to the AP Top 10 some years. While this year may be a “down year” for Bronco fans as they are not waiting to crash the Big Boys’ Playoff Party, Boise State (6-2, 3-1 Mountain West) is still sitting tied at the top of the Mountain West. The return of RB Jeremy McNichols (who rushed for 166 yards last week) coming off an injury took some pressure off of Freshman QB Brett Rypien. The Broncos still sit in good shape to win the Mountain West, but they’ll need some help from the conference counter parts after their earlier loss to Utah State. Western Kentucky is a team that should be getting more love than they are currently. But hey, come on, they’re just some ole team in Conference USA, right? No sir, they’re not just any ole team. 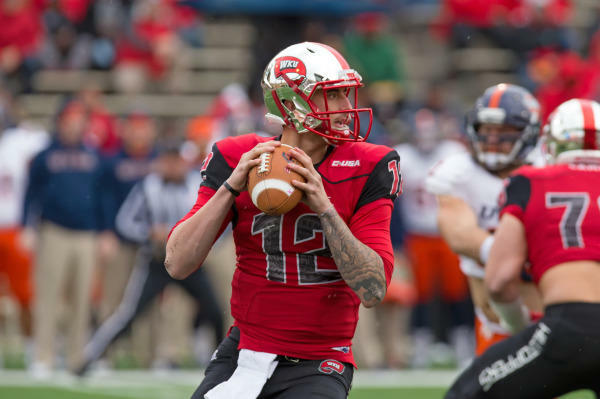 Western Kentucky (6-2, 4-0 C-USA) has one of the most dynamic offenses in the country. Their two losses came to two good teams: Indiana (L 38-35) and LSU (L 48-20… not much different than the LSU-Auburn game). Among WKU’s wins also includes a win over Vanderbilt. Yeah, its Vandy, but that’s a C-USA team over an SEC team. In conference play, the Hilltoppers have won by an average of 24.3 points. They might not make it to a New Years day bowl game, but if they matchup with a Power 5 school in the postseason… watch out. I’d be picking WKU. Navy (5-1, 4-0 American) is a team that can be a threat to any team, whether its one of their undefeated conference foes in the rising AAC, or a Power 5 team in the postseason. However, Navy showed some weaknesses last week against Tulane. For any team preparing to play Navy, all they have to do is call up Lionel Washington (Def. Coordinator at Tulane). Tulane held Navy to just 133 rushing yards. Not only the fewest any team has held them to this year (including Notre Dame), but that is also the fewest rushing yards Navy has had in two years. However, due to Tulane’s poor execution in crucial situations and a fumble on the one-yard line, Navy just squeezed through what could have been a disaster. It’ll be interesting to see how Navy’s next opponents adjust to their triple option attack. The Thundering Herd have been the face of Conference USA recently. However, most of that was Rakeem Cato. Without Cato, no one truly knew what would happen. Marshall (7-1, 4-0 C-USA) is on a six game winning streak, with their only loss coming to Ohio out of the MAC. Over the last four games, the Herd has emerged as one of the nation’s best in scoring defense allowing just 11.8 point per game. Combine that to their offense averaging 33 points per game. The biggest threat to end Marshall’s winning streak is their Nov. 27 matchup Western Kentucky. Call it what you will since it’s a C-USA matchup, but that, my friends, will be one helluva game if these two teams keep up the pace. As we all know, Memphis “shocked the world” with their upset over Ole Miss. But I, being the AAC enthusiast that I am, was not in the least bit surprised. Memphis (7-0, 3-0 American) is a damn good football team. When you watch them play, it is just mind boggling to think that four years ago this week, a New Orleans Advocate newspaper header read “Tulane Falls To Lowly Memphis”. But as Toby Keith might say, how do you like them now? Memphis is a legitimate contender. After a big win like that, sometimes teams will spend too much time celebrating and slack off (much like Ole Miss did after beating Alabama again this year). However, after starting the game slow, Memphis put up a whopping 66 points while racking up 704 yards in total offense. Yes, you read that correctly. Memphis faces Tulane this week at home, a supposedly easy game, but afterwards their schedule gets challenging as they play Navy, at Houston and at Temple. Expect those games to sort out the contenders from the pretenders at the top of the AAC. Most of us know App State as the team who pulled the “Upset of the Century” when they (at the time an FCS team) blocked a field goal to upset the 5th ranked Michigan Wolverines. It was a Cinderella Story. But, Appalachian State (6-1, 3-0 Sun Belt) isn’t a Cinderella anymore. In only their second year as an FBS football program, the Mountaineers have won nine consecutive conference games and defeated their second-year (but atop the conference) foe Georgia Southern. Appalachian’s lone loss came to a very, very good team… Clemson. Since that Clemson loss, App State has won five straight games by an average of 32.8 points per game. Big Boys, watch out, you may not want to play Cinderella in a postseason bowl game. Toledo is a story that many college football fans have been following after the Rockets upset the Arkansas Razorbacks… in Fayetteville. Last week against UMass, the Toledo Rockets (7-0, 4-0 MAC) were trailing by 18 points before rallying in the second half to put up an extra 41 points to save the day, and perhaps save the season. The Rockets play their next three games on the annual #MACtion ESPN weeknight games. The first of those three, Northern Illinois, should be one of the Rockets’ first big tests since that win against Arkansas. Stay tuned to see how Toledo fares. So far, the best story in college football has been the Temple Owls. Temple was in the old Big East and was so bad at football that they were kicked out. Then they were independent, in the MAC, and somehow got back into the Big East without really proving a whole lot. But now, ladies and gentlemen, the Temple Owls (7-0, 4-0 American) may be the team to beat. Most of these NSLG teams are running spread offenses. They’re using speed, space, and big plays to beat some of the big dogs and dominate their same-caliber teams, but the Owls are a different story. When you watch Temple play, they will run it down your throat and they don’t care how good your front seven is supposed to be. Sure you can try to return the favor, but I would put money on that pursuit being unsuccessful. Temple plays like the Big Boys. They beat Penn State earlier in the year, but not only did Temple beat Penn State… they sacked PSU’s quarterback TEN TIMES in the game. They face their biggest test this Saturday as Notre Dame comes to town to take on the Owls at Lincoln Financial Field. It’s so big that even ESPN College GameDay is showing up for the game of the week. Even if Notre Dame comes out strong, don’t lose hope on our Fighting Owls, as Temple is one of the best second half teams in the country. Last week against a good East Carolina team, Temple scored 14 points in the last 3:31 to pull off their “upset” over the Pirates at ECU. Along with Houston, Memphis, and Navy, Temple is the leader in proving to the county that the American Athletic Conference deserves consideration, and even an automatic bid, in getting into the New Year’s Six games and a fair shot at the College Football Playoff. I’ll be rooting for the Owls this week. “We The T” I think is what they say, er, idk, Roll Owls? Whatever, GO TEMPLE GO! Houston had what seemed to be a huge win over Louisville at the beginning of the year. Don’t get me wrong, that was a big win. But if they were to play again, I might would take Houston by 30 points. Louisville turned out to be, eh, ok. Houston turned out to be Ohio State Junior (quite literally, as head coach Tom Herman was the offensive coordinator at OSU last year). However, since the Louisville game, their schedule has not gotten any tougher. However, they’re still proving that they are a damn good football team by averaging 47.6 points per game with three games scoring 50 points or more. Four times during the 2015 season, Houston (7-0, 4-0 American) has had their offense reach the 600-yard mark. With the 5th ranked offense in the FBS, there may not be a team that can stop this steamroll. But not only does Houston have a killer offense, they also have a Top 50 defense (ranked 41st according to NCAA.com). Having that Top 50 defense with a Top 5 offense is very rare to have on the same team. As history shows, its teams like that who recently have made a run for the trophy. However, on November 14th we will find out who reigns in the AAC West as the Houston Cougars will host the Memphis Tigers in the 3rd year TDECU Stadium. The Battle of the West will be a showdown for sure, but the winner of that game will likely have to face Temple on December 5th for the Inaugural American Athletic Conference Football Championship. SEC fans, ACC fans, B1G fans (or whatever your football drug of choice is) DO NOT count out the AAC. Stay tuned, but one of these teams could be crashing the New Years’ Party. And I’m not just talking about the bowl game either… we’re talking potential playoff.